36 hours later: Herald the great Charger accomplishments in Hillsdale’s loss at Grand Valley. Leading 35-34 with 1:17 left to play, #11 ranked Hilldale College’s Joe Glendening found the Grand Valley endzone to cap a 224 yard, 3 touchdown night of rushing, putting Hillsdale up 41-34 on the number one team in the country. Then the unthinkable happened. On a botched extra point, Grand Valley’s Luther Ware scooped up the ball and ran it back for the 2 points making the score Hillsdale 41, Grand Valley 36. Quarterback Kyle McMahon would lead a heroic touchdown drive for Grand Valley and the team that made it all of the way to the National Championship game a year ago would run its streak of home regular season wins to 44 and defeat Hillsdale 44-41. What has been debated for the last 24+ hours and is sure to be debated for a long, long time is whether Hillsdale should have kept driving for the score. Announcers on the Grand Valley webcast were adamant that all Hillsdale needed to do was take a knee before Glendening’s score and the Chargers could have run out the clock. I am not 100% convinced that is true and the statistical play by play doesn’t list the time on the game clock for every first down. I don’t exactly how the timing would have worked out, but with that strategy, at worst if Hillsdale gives Grand Valley the ball back inside its own 10 with a handful of seconds left. We could sit here and go over every single scenario of coulda, woulda, and shoulda. But all that would do is detract. We’ll leave that for the old timers to chew on over their coffee cups at the Palace Cafe in downtown Hillsdale and focus on the effort it took just to get the Chargers to the unraveling point. What is most important about Saturday night in Allendale is all of the good we witnessed in this epic battle that can take Hillsdale College football to bigger and better things. •Head Coach Keith Otterbein and his staff know they could have managed the clock better and I am sure this memory will stay with them the rest of their coaching careers. Call it a blunder. Call it whatever, but know that something this uncharacteristic of a staff known for making sound decisions will only make them grow from it. When you consider all that Otter and Company have overcome since arriving in Hillsdale 9 years ago, they aren’t going to let this discourage them. They’ll own it and move on, only more determined to be better coaches. •Hillsdale College proved it can play with anyone in the country. Last year’s win over Grand Valley was amazing and featured some tremendous performances. Hillsdale was crafty and wily and seemed to be in the palm of fate as the Chargers pulled the upset for Homecoming. Not taking a single thing away from that effort, it still felt like an upset. This year’s game though, had an entirely different feel to it. Nothing about this effort felt like an upset in the making. The Lakers had nothing to play down to this year. Hillsdale’s offensive line physically dominated the Grand Valley front and so many of the great skill performances we saw came from great run and pass blocking. Glendening, Mike Blanchard, and Andre Holmes looked just as intimidating and skillful as anyone GVSU could run out there and in many cases posted superior performances. Troy Weatherhead proved he belongs in the conversation when it comes to top signal callers in this league, if not Division II. The Charger defense bowed to no one. Still primarily made up of underclassmen, they didn’t care when it was fourth and goal that Grand Valley had all of those trophies in the display case right behind them. 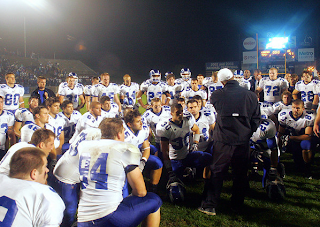 They played with great enthusiasm and made stops when Hillsdale needed it most. •It has been since 2007 that a running back has gained 224 or more yards against Grand Valley. Joe Glendening’s performance on Saturday must be treasured. I promise to never ever make any more comparisons between him and Scott Schulte of the early 90s. I am going to just let Joe be the best Joe that he can become…and enjoy every single footstep. The footwork, the body lean, the power, the extra gear were all there just like they were in those 3 state championships he won with East Grand Rapids at Ford Field. They started calling him “Joe the Show” back at East when he was just a middle schooler. I promised myself that I would not use it (I mighta let it slip already) until Glendening had established himself as a D2 back capable of carrying the load at this level with some of the highlight moves we hoped to see recreated from his days at East. Guess what! I would say that Joe the Show did that on Saturday night with a 35 carry, 224 yard, 3 touchdown display against the number one team in the country. •How about the poise, patience, and leadership Weatherhead showed at quarterback in the most hostile of Division II environments on Saturday night? There have been many, many quarterbacks who have come into Lubbers Stadium only to need a new pair of football pants after their first series…if you will. Not Weatherhead on Saturday. When I think of his last three trips to Allendale, I think about how his field presence has gotten so much stronger on each try. The playoff appearance was better than the loss in 2008, but Saturday was head and shoulders above both. He was the captain on Saturday night and truly led the offense. As good as the leadership was, his 22 of 28 for 241 yard, 3 touchdown night of production was nearly flawless. With it, Weatherhead passed his quarterback coach Mark Nicolet and moved into second place on the all time Hillsdale passing yards list. For the season, Weatherhead has completed 44 of 54 passes. That is an amazing 81.5%! The next closest in the GLIAC is Taylor Housewright of Ashland with a 63% completion rate. Troy’s lone interception was the Hail Mary at the end of the Grand Valley game. A 210 yard passing effort this Saturday at Ashland will give Weatherhead 7061 career passing yards, enough to surpass Bill Skelton’s 7060 all-time mark set between 2000 and 2003. This is going to be my last word on the Grand Valley game. As tough as it was to watch Hillsdale lose the game on Saturday night, all of the great things the Chargers did must be heralded. Former Charger Rick Vear and dad of current safety Joe Vear reminded us on the Facebook group that 25 years ago Hillsdale lost a very similar game to Saginaw Valley early in the season. That team used the loss as a motivator and went on to win the school’s only National Championship. How will this group of Chargers respond this week at Ashland? If they just keep playing like they did on Saturday night and there will be great things happening for Hillsdale College for many many weeks to come.